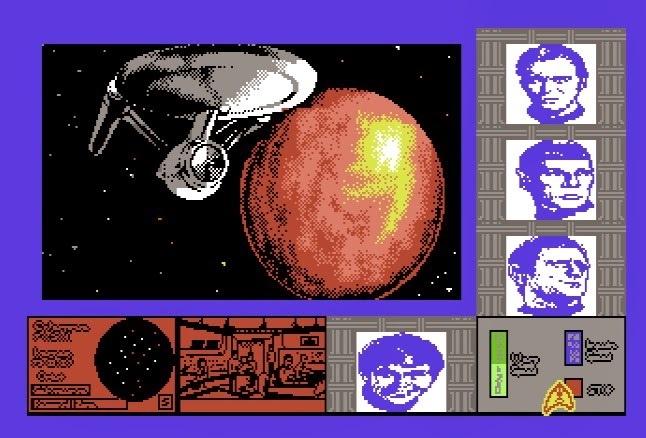 Combining computer games with Star Trek (two of my favourite things) will always be a winner for me, but the first time I experienced this unique combination was back in 1988 (or maybe 1989 - it was so long ago!) with a little known game on my friend Steve's Atari ST…. 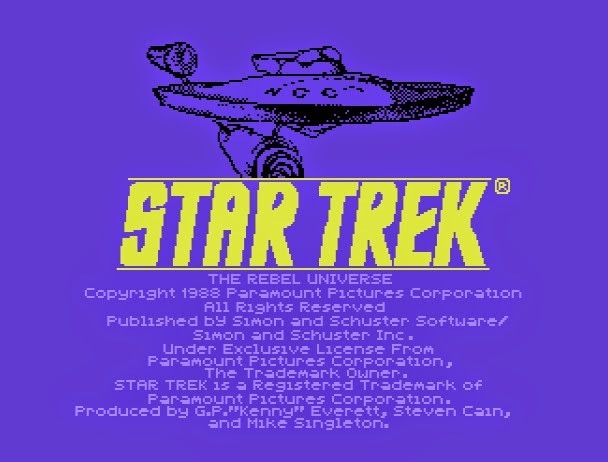 Star Trek The Rebel Universe. It was developed by Firebird Software which itself was a division of the UK’s main telecommunications company, British Telecom. It was designed by the late Mike Singleton, renowned game designer and programmer who also created The Lords of Midnight, Doomdark’s Revenge, Midwinter, and many others. 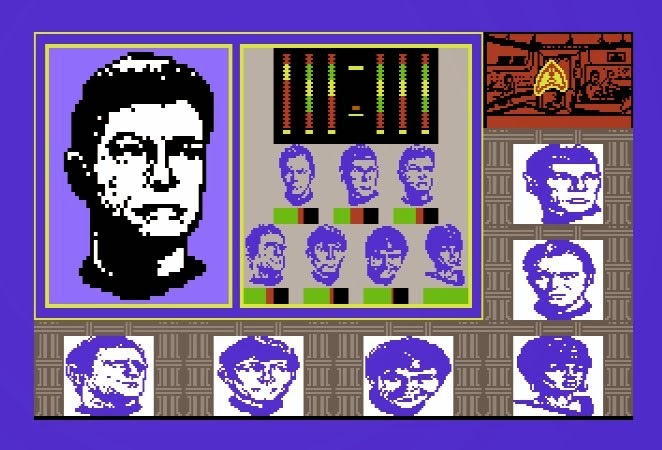 Now, for reasons unknown (well, possibly due to poor sales), the game was only released for a small number of computers – The Atari ST being one of them, IBM PC, and…. The Commodore 64. However, the game wasn’t easy to come by. 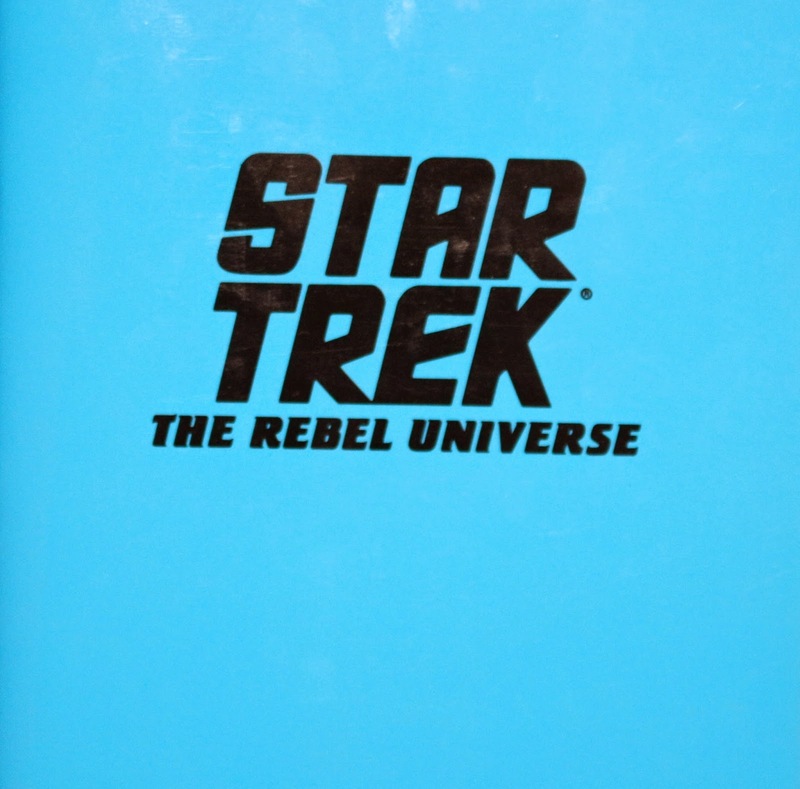 Now it wasn’t until my birthday in 1990 when a trip into Basildon to spend some birthday money in Woolworths ended up with me coming out of the shop a very happy 13 year old with a copy of Star Trek The Rebel Universe. It was cheap too, but that was because the shop couldn’t find the instruction book to go with it. Hey, I didn’t need the book – I already knew how to play it from the Atari version. 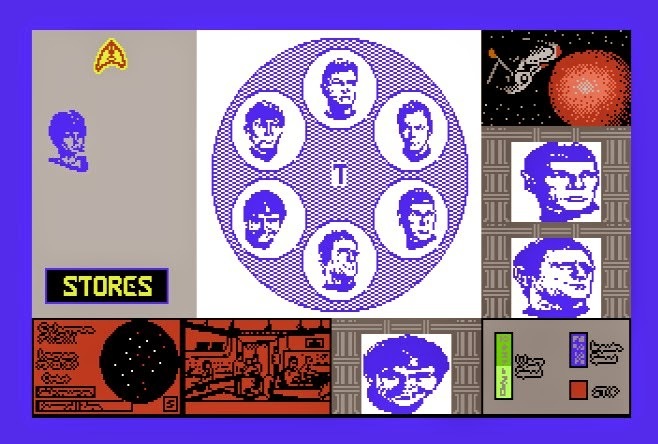 The game consists of various styles of gameplay but is completely controlled via an intuitive icon driven system which was quite original at the time. The story is this… The USS Enterprise and its crew under the command of Captain James T. Kirk has been sent by Starfleet Command to investigate an area of space that has caused any previous Federation starships and crew to mutiny and turn against the Federation. 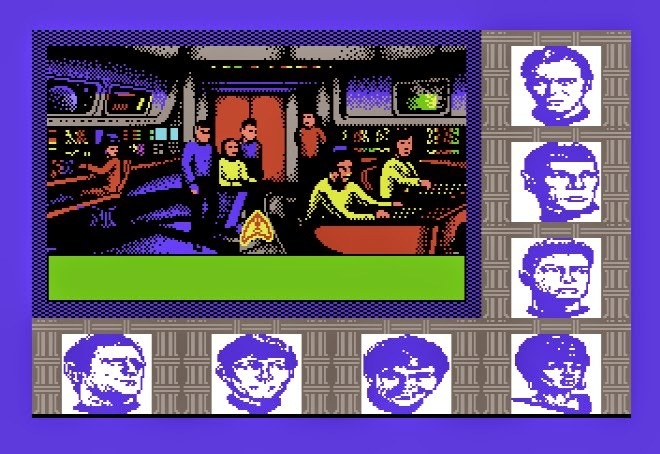 There are many ways to win the game (something I never did manage) but what made this game special was that it really made me feel like I was Captain Kirk. 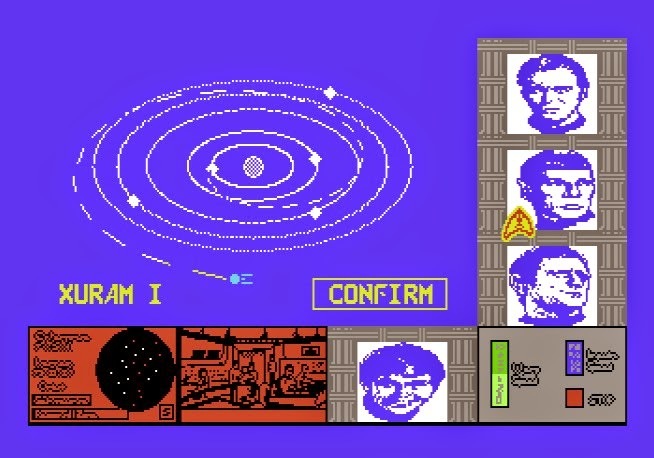 Being able to select a star system and warping to it, then plotting an orbit around a life supporting planet before beaming down with all my favourite characters from the original series only to be recalled back to the Enterprise again because it was being attacked by a fleet of Klingon battle cruisers, Romulan Bird of Preys, or even rebel Federation Starships. 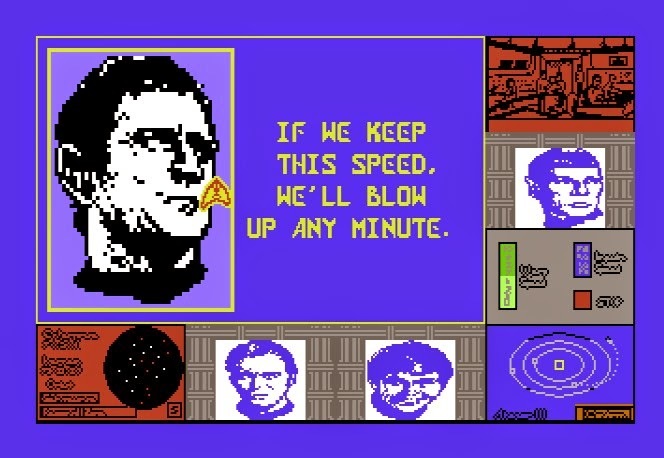 It was great, and it was only achievable on my Commodore 64. 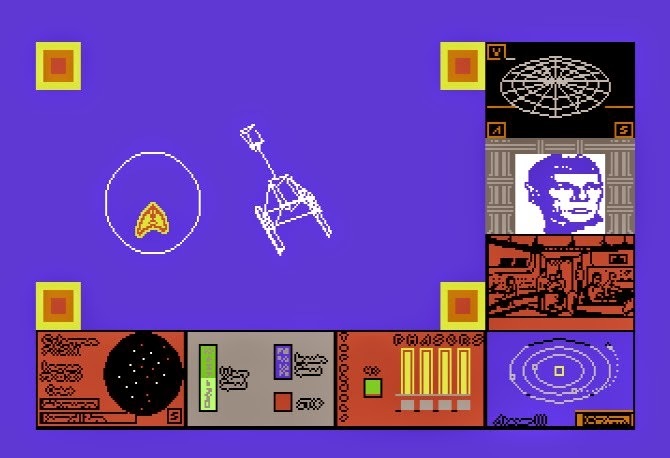 As mentioned before, the game is icon driven, and the main screen is divided in to 8 sections – 7 of which are the digitised heads of the command crew of the Starship Enterprise, and then the main gameplay area. Clicking on a digitised head takes you to that persons screen where you can control that persons responsibilities. Mr Sulu - For navigation, plotting courses to star systems and orbits. Mr Chekov – Weapons control. Mr Scott – Checking the status of the Warp and Impulse engines. Mr Spock – Ships status, and planet analysis. Captain Kirk – Checking the ships inventory, and beaming down to life supporting planets. On arriving to a star system, the Enteprise can orbit any planet, but the crew can only beam down to ones that support life. When beaming down, you can choose which characters you want as part of your landing team. 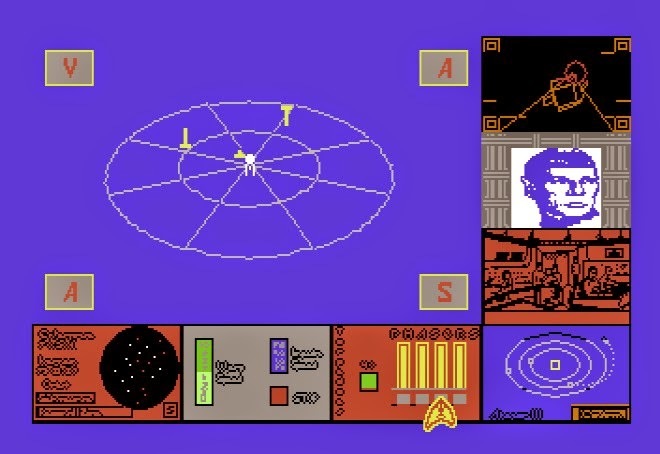 Once you have beamed down, you can search the planet, while facing some simple puzzles and obstacles which can be overcome by either a suggestion from a member of the team, or from an object picked up from a previous away mission. Beaming down is depicted by using very basic line graphics, but it’s enough to make you feel like you’re on an alien planet. This fantastic image appears once orbit is achieved. Selecting your landing party. Nothing against Uhura, but I've always left her on the ship! The command crew of the USS Enteprise face their biggest challenge.... A door! Another fun part of the game is the combat. 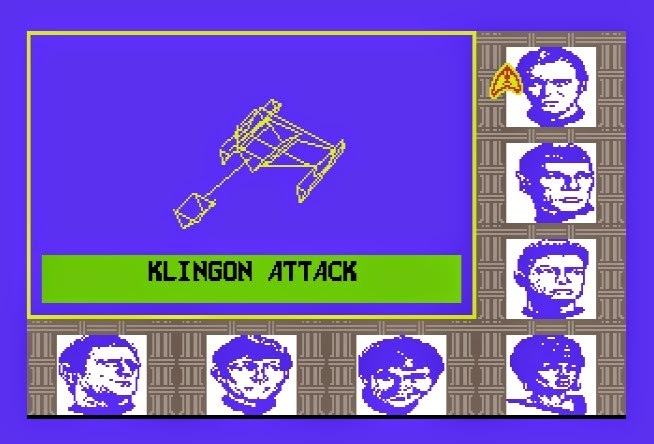 Occasionally you’ll be attacked by Klingons, Romulans or rebel Federation starships. Selecting Chekov and choosing whether you want to fire the more powerful (but limited) Photon Torpedos, or using the lesser powerful (but rechargeable) phasers really makes you feel like you are on board the ship and in control during battle stations. 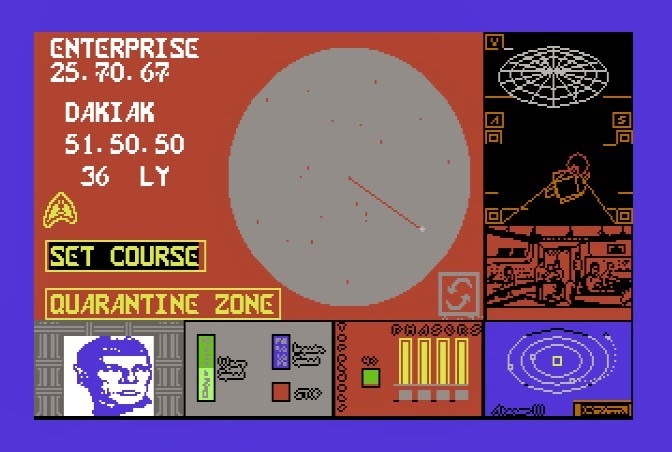 The combat is shown in wireframe vector graphics and although they look very simple on the Commodore 64, they move fairly quick, and it can get quite intense when locking on to an multiple enemy ships and firing. Klingons on the starboard bow. Great vector graphics. 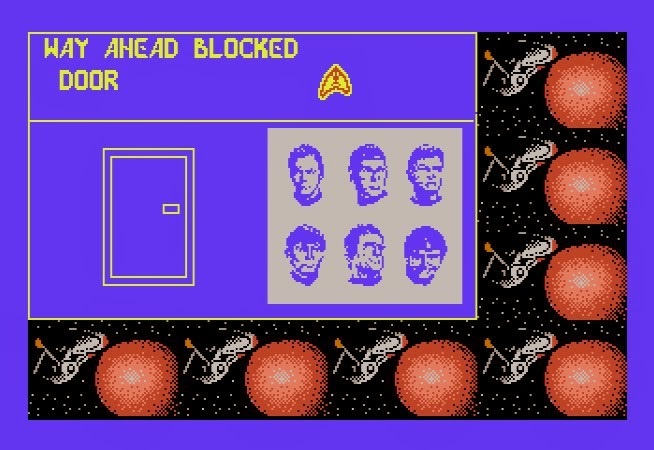 Modern Star Trek games are usually hit or miss. I loved Star Trek Voyager Elite Force, Deep Space Nine The Fallen, but none of them capture Star Trek the way The Rebel Universe did, and neither did they give the player the freedom to boldly go wherever they wanted. The Rebel Universe allows players to explore star systems in a non-linear way, and features some very impressive graphics (albeit a little blocky is places). Travelling at warp speed for a long time will stress Mr Scott out! Dr McCoy is busy caring for the command crew after a disastrous away mission - wait, who is running the ship? Course plotted for the Dakiak star system. I spent countless hours playing this game, and even though I never did find a way to win, I still go back to it every now and then. 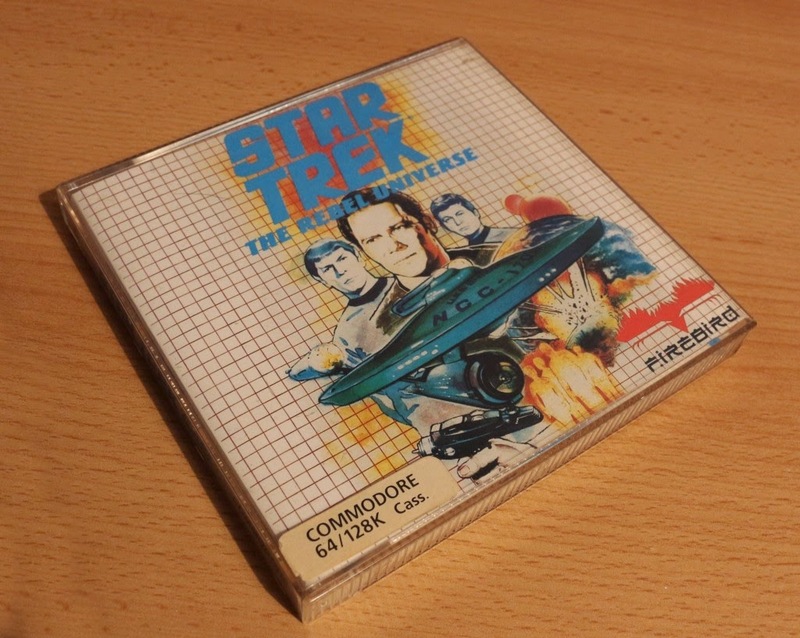 Yes the Atari ST version is/was better with its improved graphics and digitised sound effects, but the Commodore 64 version showed what could be done to put a game designed for a 16-bit computer in to a single loader game on a computer with limited memory. A nice instruction manual with back story to the game. A good read. 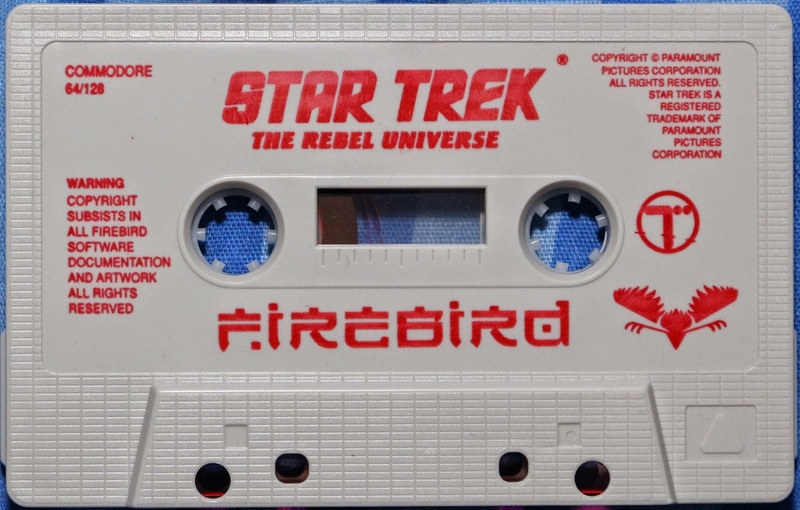 Hi, I worked at Firebird and was heavily involved in the C64 conversion of Star Trek - The Rebel Universe from the publisher's side. I have a web site at http://birdsanctuary.co.uk/trek/i.php which might be of interest (although that version of the site is due to be replaced later this year).